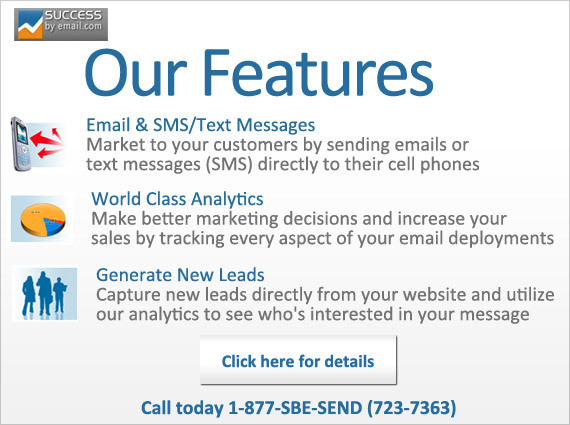 Successbyemail.com is an affordable enterprise class email and SMS marketing service that enables you to deploy hundreds or millions of emails to your list, and measure the results. 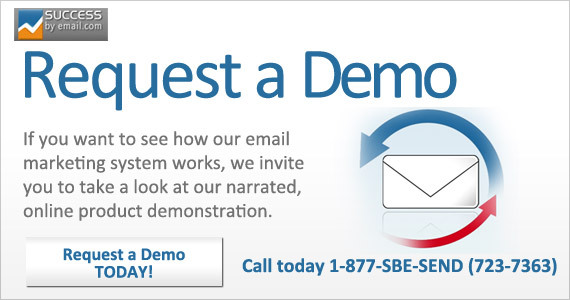 Contact us at 1.877.SBE.SEND to see how we can help you. Deliver the Right Message at the Right Time! 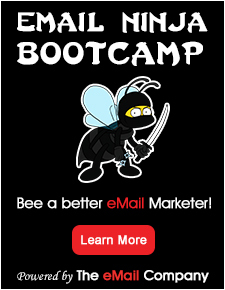 With over 15 years experience creating corporate websites and custom applications, the people behind SucessByEmail.com know what it takes to create the most effective and comprehensive email marketing messages. Aside from providing you with one of the most powerful enterprise-class email deployment engines anywhere, we are committed to adding value for all of our customers by helping you implement unique and custom strategies that yield maximized results. Weather you’re looking for an affordable way to send an email newsletter, critical email promotion, or simply build your list, discover how SuccessByEmail can help meet your needs. Start your FREE trial today! Click here. If you want to see how our email marketing system works, we invite you to take a look at our narrated, online product demonstration. Our flexible tour format allows you to stop, skip or replay sections as needed. To setup a demonstration of Success by email, click here for details. Although SuccessByEmail offers you numerous professionally-designed templates, we also offer to design custom HTML email templates specifically crafted for your organization. 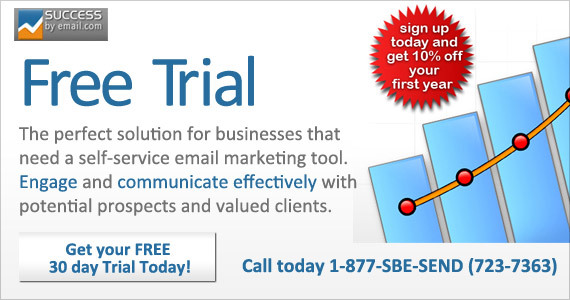 Most SBE customers use the comprehensive self-serve tool to deploy their email messages and measure campaign results. SuccessByEmail also offers email deployment services managed by product specialists for those customers who prefer to sit back and experience the results and power of effective email marketing.